What lives far outside the Small Magellanic Cloud? As one of just a handful of extragalactic objects so close that it can be seen with the naked eye, the Magellanic Clouds (MCs) are among the most well-studied galaxies in the sky. de Vaucouleurs’ published his seminal work on the MCs in 1955. More recently, astronomers have observed the galaxies extensively searching for MACHO dark matter by watching for microlensing events against the backdrop of the LMC. We’ve learned an awful lot from all these observations. In the most general terms, the Small and Large Magellanic Clouds (SMC and LMC) can be described as dwarf irregular (dIrr) sattelites of the Milky Way. But in more detail, much of the evolutionary history of the local group, and galactic evolution in general, has been illuminated by studying the structure of these two nearby galaxies. The complex dynamical interactions between the MCs and the Milky Way, the Andromeda galaxy (M31), and other galaxies in the Local Group have left their mark on the Magellanic Clouds, prompting increased star formation as well as stripping gas from them. These interactions have given them an irregular morphology and tidal features such as the Magellanic Bridge and the Magellanic Stream. The red and purple boxes on this map are the fields where the MAPS project has observed the extreme periphery of the SMC. 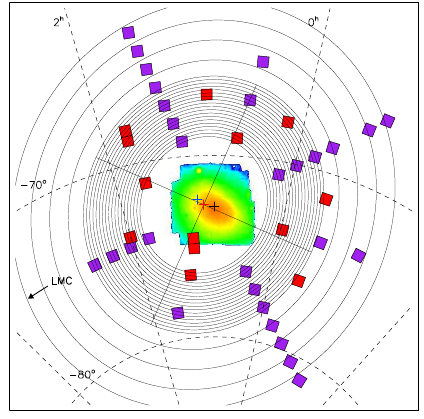 Previous studies of the SMC focused on the central region shown as a density plot here. The MAPS fields stretch about 10 deg out from the center — 20x the size of the full moon! The ellipses represent lines of constant stellar density as determined by star counts in the MAPS fields. Note that the density gradient becomes much shallower outside about 7 deg. Figure 1 of Nidever et al. 2011. 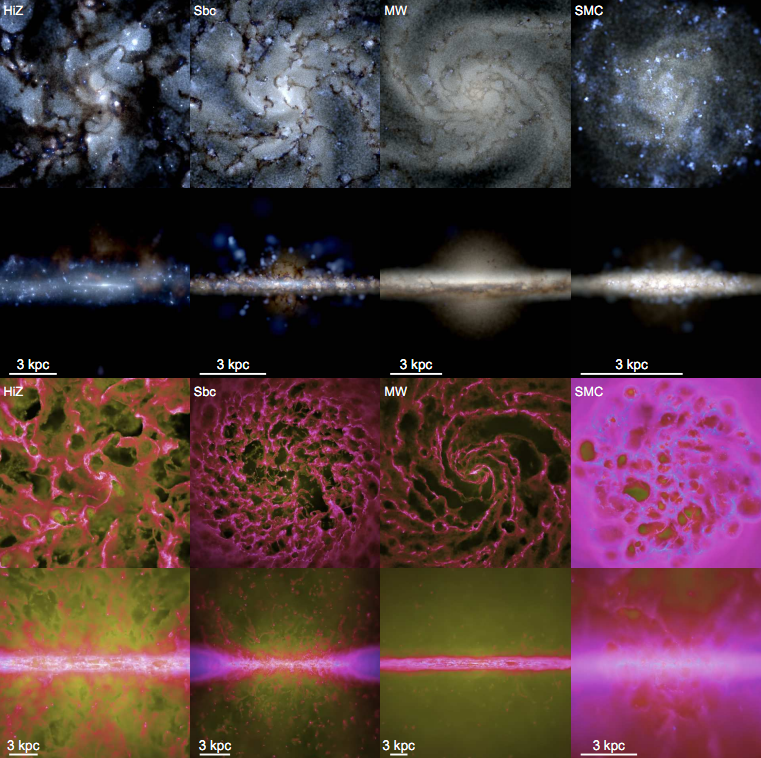 These authors report the first results of a project called MAPS (MAgellanic Periphery Survey), which is intended to reveal more about the structure of the LMC and SMC through photometric and spectroscopic observations of many stars in the outskirts of these galaxies. Previous observations out to from the center of the SMC have indicated that it has stellar structures typical of dIrrs. Its younger, bluer stars tend to be found in more clumpy distributions near the center of the galaxy, while the older, redder stars extend farther outward and follow an exponential radial density profile typical of elliptical galaxy populations (as opposed to a disk). But we might expect the SMC to have a more complicated structure, given all of the dynamical interactions we know it has undergone. The MAPS project is observing the MCs out to more than twice the distance of the older surveys, , using the CTIO 4m Blanco telescope in Chile. From their imaging data, they produce color magnitude diagrams from which they can estimate the ages and metallicities of SMC stars. They estimate the density of giant stars (which are bright and easy to detect) at different radii from the SMC by counting them in each field, taking care to distinguish SMC giants from Milky Way or LMC giants that happen to be in the foreground based on their colors. From the stellar density profiles they have constructed, they conclude that the SMC has two distinct components in its outer stellar structure. They find an “intermediate component” at distances that is composed primarily of older stars and has an exponential radial density profile. For , they find a separate component with a much more flat radial profile that may be a remnant of tidal interaction or is perhaps analogous to the halo of the Milky Way. Expect to see future results from the MAPS project, where spectroscopic measurements will give radial velocities for many of these stars, allowing us to determine the kinematic structure of the Magellanic Clouds.